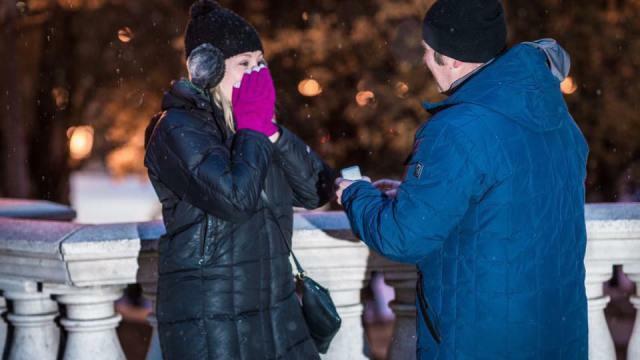 CHICAGO — Photographer Julio Salazar was doing a photo shoot on Saturday for a client in Chicago’s Millennium Park when he heard some commotion -- it just so happened, a couple was getting engaged. He already had his tripod and lighting set up, so when he heard cheering, he turned and began snapping photos. But when he looked at the photos, they were all dark. Once Salazar got home, he started working his magic and edited the photos. He had taken seven or eight photos of the couple, but only one was clear and in focus, CBS Chicago reported. Salazar was able to capture the moment of a man proposing. The couple had no idea Salazar took their picture, and he did not know them. Salazar wanted to find the couple, but had trouble locating them. “My biggest goal was to get the photo to them,” Salazar said. He took to Facebook in hopes of finding the couple to give them a copy of the photograph. He started on two virtual garage sale sites and his photography page creating posts on Sunday asking for help. CBS Chicago was the first one to share the photo and post within 30 minutes – and the sharing continued from there, Salazar said. The post got so far, that he even received a message from a woman in Georgia. People started tagging possible persons that were in the photo. Eventually, one of Salazar’s acquaintance on Facebook reached out and said, he thought he knew the woman in the photo. The friend shared Salazar’s phone number with the woman and the search was over. Other people tagged her name as well. Because the post was shared and viewed by thousands, the search only took three to four hours, Salazar said. The newly engaged woman is Jessica Wic, and her fiancé is Clay Cleveland. Since the connection has been made, Salazar shared the photo with the couple and Jessica made the photo her Facebook profile picture. Salazar said the couple was very excited when they received the photo. “You could tell they were happy and smiling,” Salazar said, describing the phone conversation. Salazar said he was not expecting this. He was not looking to gain publicity or a job. “I just wanted to get the photo to them and give them the printing rights,” Salazar said.